Life less hurried, living in the slow lane: IT IS BERRY SEASON! Simple living for the modern world. whole food recipes, natural living, gardening, preserving, home remedies, and life skills taught. We are in the middle of berry season. What does one do with all the great berries that are all around right now? Triple berry pancakes of course! 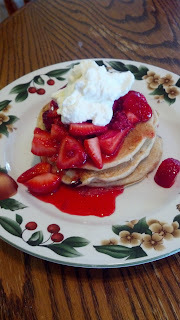 It all starts with soaked pancakes made with whole wheat flour and a natural yeast start. While they are cooking add blueberries right on top of the batter. What could be more wonderful then fresh whole wheat blueberry pancakes? Blueberry pancakes topped with fresh strawberries and raspberries! Add a dollop of fresh whipped cream and you have a nutrition packed breakfast fit for a queen or king, and it is super yummy to boot. Thank you so much for sharing with Full Plate Thursday. Hope you are having a great weekend and come back soon! We love berry pancakes! I like to make mine chocolate and serve fresh berries on top. Yummy! Visiting from Melt In Your Mouth Monday! Yum, yum, yum! Thanks for sharing! Followed you link from A Humble Bumble, and so glad I did. These look delicious!!! I am a happy stay at home mom with three young children on quest to live the simple life. TO LOVE MY FAMILY WELL IS THE HEART OF WHO I AM.